Yesterday, my youngest child, the Princess, obtained her driving learner’s permit. That’s the last time I’ll go through that particular milestone of life, hooray! Nothing is scarier than going through the process of teaching kids to drive, so I’m glad she’s the last one. Life with the Princess has long been full of final milestones. With her, I’ve celebrated the VERY LAST diaper. (Well, until grandchildren. But you know what I mean.) The very last baby learning to crawl, to walk, to talk. The last bottle and binkie. The last time through the Terrible Twos and Tantrum-ridden Threes. The last first tooth lost. The last first day of school. The last graduate of elementary school. The final middle school student. The last time through every other measure of growth and change children go through to this point. She’ll be my final high school graduate in a couple of years. I enjoyed those milestones with my firstborn, filled with wonder, because they were new accomplishments. I enjoyed them with sons 2, 3, and 4 because it was a measure of where they were in life, a sign they were growing up, that we were all moving along. But it’s different with the Princess. Partly because she’s female, and let’s face it, so many of those experiences are handled differently by boys and girls. So in a way, even though I’ve been through these things several times, with her they are new. It also feels different to pass those milestones when you know it’s your last time. There’s a poignancy to tossing that last bottle in the trash, a wash of memories that accompanies the final act of the Tooth Fairy. Most of all, as her adulthood speeds ever closer, I leave behind more sure things and stare out at vast possibilities. Because when your children are growing, there are certain things you can count on. Certain experiences, milestones, that everyone passes through. You know, as much as you can ever know in life, that particular experiences are built into the timeline. There’s something stabilizing about knowing a bit of what to expect in the lives of your children. Once they graduate high school, the way-stations along that timeline become fewer. College or other post-secondary training options. A career. Marriage. Children of their own. My children may experience each of those, or only one or two. Or some more than once. It’s all unknown, a voyage of discovery. I’m already there with my oldest three. Son 4 has one year left before he graduates and flies into the unknown. I’m glad I have a while longer with the Princess, to savor the last of the measured portion of her life, and of my own. After all, once she reaches adulthood and the world of possibilities opens before her, so will it open for me. Once I have completed the work of raising my children, and with my Helvetican still fully engaged in his career, I’ll find myself with nothing but a few vague possible milestones (grandchildren?) and a whole landscape of choices and opportunities. I’m going to have a blast! If you’ve reached that point in your own life, what have you chosen to do as you move forward? If you’re not there yet, what do you dream of doing? Don’t mind me. 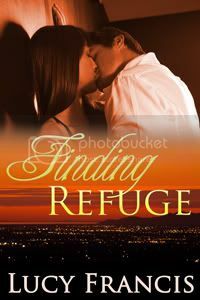 I’m just sitting here clicking refresh every few minutes, wondering when Finding Refuge will finally go LIVE on Amazon. I’m not, however, clicking refresh at Barnes & Noble, because I know we’ll be lucky to see it there by tomorrow. Ok, I think I’ve got the blog’s new look in a good place for now. I reserve the right to change it at any time, because, you know, I’m a girl.